Louisiana....... Having never been in the state before everything is a new experience. As we drove down the interstate we are flooded with signs promoting casinos and restaurants touting their crawfish as well as items we have never heard of before such as Boudin and King Cakes. Once we got off the main roads, we began seeing other mysteries to be unraveled! One of the first things we noticed was the farm fields. There were miles upon miles of fields, some were flooded with several inches of water, others looked like they were flooded and drained. A few of the fields had flat bottom boats on them and rows of what looked like metal cages on them. Very interesting and another mystery solved! 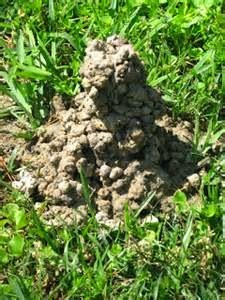 Next up was all those little mud mounds we saw in peoples yards. Some yards only had a few while others seemed to have hundreds. Moles, voles, shrews? Or are they termite chimneys? We were wrong in all accounts. Click here to see what really causes these mounds........................... Yep, it's those darn crawfish again! The entire area seems to revolve around these little buggers from the farms to the restaurants, the local economy is dependent on crawfish, shrimp and oysters. One of the things we wanted to do while down here was to experience the local cuisine and it looks like we found just the place to do it! Other things were not mysteries but interesting nonetheless......... Raised houses to preventing water damage during flooding were common and the moss hanging in the trees were other sights we were not used to seeing. Palmetto Island State Park just outside of Abbeville is the newest park in Louisiana's system. At $20 a night they have beautiful sites with 50amp power and water, two comfort stations with free laundry/showers and a centrally located dump station. Numerous wildlife sightings, armadillos are everywhere within the campground. At times there was at least one every couple hundred yards, some of them even invaded our campsite driving Daisy nuts! In addition to the armadillos we saw deer and alligators. Word has it that there are feral hogs and black bear as well but we did not see any. The park's almost 100 sites were empty with probably only 10 campers total but 1 of the 10 campers were virtual friends of ours who we had been communicating with on line for almost a year! Steve and Deb McCormack are fellow full-timers and bloggers (Down the Road) who have been on the road since June of last year. On day two of our stay we broke out the kayak and paddled one of the creeks within the park. Deb and her dog Hurley joined us on the paddle which took us through narrow channels into small lakes before it eventually dumps into the Vermillion River and the intercostal waterway. It was on this trip where we saw the alligators in a couple of the smaller ponds. It is eerie seeing them drift across the top of the water with just their eyes and nose above the water then they slowly submerge as you approach. We were questioning ourselves as we paddled our inflatable kayak over the spot where they submerged. Now it was time to get to tasting some of that local cuisine! We went to dinner that night with the McCormack's. The first thing Steve insisted we have was raw oysters. Neither Barb or I have had them before so we were a bit hesitant. When the oysters arrived, we applied some cocktail sauce and down the hatch they went.... they were actually pretty good but I don't know we could have them without the sauce. Trying to decide what to have for our main course was a challenge. The area is known for their crab, shrimp, crayfish and oysters. We opted for a couple of dishes that let us taste everything. Both were absolutely delicious! As we were eating the waitress came by with a free pitcher of beer for Steve and I, a little while later she came by and said she was off duty and would be leaving. We continued chatting and swapping stories and before long the pitcher of beer was empty and it was time to head back to the campground. As we got up and looked around to see we were the only ones left in the restaurant! We had been there over 3 hours! The next day we wanted to try a "Po` Boy" while we were down here so we stopped by a local place called Suire's. It is basically a small corner grocery store that also serves food, we arrived right at lunchtime the and parking lot was packed. As soon as we walked in it was apparent that we were the only outsiders so we must have come to the right place. A Po` Boy is a traditional submarine sandwich in a baguette bun, Barb had an alligator Po` Boy while I opted for shrimp. The alligator was a firm meat and a little chewy but still very good. Interesting but not a typical place we would stop! Our next adventure was the Parish Brewing Company just outside of Lafayette where Steve and I each had a flight of beers sampling some of the local brews. Not being a fan dark or "hoppy" beer there were a couple that we a little strong and a couple that were perfect for my taste. Steve, who belongs to a brew club seemed to enjoy each of the different brews. From there we headed back to Abbeville for dinner at another local icon, Dupuy's Oyster Shop where we again had an awesome dinner. Keeping up with the theme from the night before, we again were the last ones to leave before they closed! The next day we stopped by Richard's Meat Market to buy some of the Boudin balls that we have seen advertised. They are made with a combination of pork sausage, pork liver and rice rolled into a ball and fried. We also bought some Cracklin, a fried piece of pork fat with a small amount of attached skin and is generally considered to be part of soul food or Cajun cuisine. We have never had either of these. Then last night before we left we mooched along with Steve and Deb who were going to meet some local friends for dinner. We went to Richard's Seafood Patio. As you can see from the outside it certainly does not look like anything special but this is one of the favorites of the locals and had a waiting line to get in. The couple Steve and Deb were meeting were born and raised in the area, Randy and June. Randy owns a machine shop in the area and June is a school teacher/librarian. Both were very down to earth and as friendly and we hit it off right away. The fact that both of them were avid hunters certainly helped. Following Randy's lead we ordered boiled crawfish, shrimp and frog legs. He certainly did not steer us wrong! After dinner we headed to Shuck's for their famous charbroiled oysters and bread pudding. Even after 7:00pm we had an hour wait to get seated. We took the time to have a few cocktails and watch the Shuck's shuckers shucking oysters. The charbroiled oysters were amazing and the bread pudding with the rum sauce was even better! By the time we left we felt like we had met some good friends in Randy and June who we will see again in the future. As a matter of fact I think we will see them in Ontario bear hunting in the next year or so! Guess what time we left that restaurant? Yep, for night number three we closed down the place! All the chairs put up, we closed down another restaurant! Having never driven the southern edge of Arizona we were surprised by a couple things that we did not know existed down here. The first were the U.S. Border Patrol Inspection Stations. These stations are scattered across Arizona, New Mexico and Texas on primary and secondary roads. Similar to the truck weigh stations we are used to in the Midwest, these inspection stations require ALL vehicles to stop and are subject to inspection by the Border Patrol. We passed through ½ dozen of these in the past week, in each case they stopped us, asked us if we were U.S. citizens, had the dogs give the rig a quick sniff and let us pass through without inspection. The second thing we encountered that was new to us occurred when we saw a blimp one day hovering in the sky. We passed it wondering what it was but we quickly forgot about it. When we saw another one heading east out of Bisbee we looked it up to see what the deal was with these blimps. 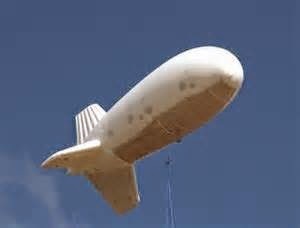 Ends up they are unmanned surveillance blimps used help find drug runners and people trying to cross the border illegally. The 72 foot blimps are tethered at 2500 feet and are equipped surveillance equipment that can monitor a 10 mile diameter both day and night. Leaving Arizona we headed to the city of Deming, New Mexico. We had a one day layover at Hidden Valley Ranch RV Resort about 15 miles outside of the city. On a typical travel day we try not to drive more than 4 hours so this was the perfect distance from Tucson. The park itself was nice, there are about 100 long-term residents at this location so it must be decent. We had picked this resort due to their Passport America discount at $12.81. Had we stayed longer we may had seen the appeal to this park, it was clean and well run, but the 10 miles of gravel road and the lack of activities in the area just did not do it for us. The next day we packed up and drove 6 hours to Toyahvale Texas where we stayed at Balmorhea State Park. About 30 minutes outside Toyahvale I noticed that the outside temps had dropped to 32 degrees, a few minutes later we were in the middle of a snow storm! I thought we were in southern Texas! Arriving at the park just before dark we set up and huddled in to the sounds of sleet hitting the top of the rig. The next day when we went out to take Daisy for her walk our steps were totally iced over and our water hose was frozen. After blowing the ice out of the hose and we spent most of the day inside watching movies as it drizzled throughout the day and never got above 38. Balmorhea State Park itself is a very quiet, no frills park, the main attraction is the swimming area created by the San Solomon Springs. It is a 1.7 acre area that maintains 72-76 degrees throughout the year. In addition there is abundant wildlife viewing in the area as well. The sites at the park range between $11 (water only)-$17 (water, electric and cable) there are no sewer hookups but there is a dump station. There is also a $7/person/day fee for entrance to the park but if you buy an annual Texas State Park Pass for $70 the daily fee is waived and you get four ½ price camping coupons. In our case, since we were staying at so many state parks heading east, it was well worth the $70. We woke up the next morning to ice coating the truck, the trailer, the trees. After it warmed up a bit we hooked up the rig and headed down the road looking for warmer weather. We had planned on stopping near Sonora but kept on going as it had not gotten any warmer. The forecast for Austin the next day was mid 50's so we headed in that direction stopping just short of Austin we spent the night at the Walmart in Fredericksburg. The area between San Antonio and Austin is known as "the Texas hill country" some of the prettiest country you will find. It is filled with cattle, goat and game ranches, except the occasional cactus plant the terrain reminded us of parts of Wisconsin. Arriving in Austin we were greeted by the sights, sounds and traffic of a bustling city. The GPS soon said we were 10 minutes from McKinney Falls State Park but we were still in the middle of the city, it was hard to believe there was going to be a state park within the city but as soon as we crossed Onion Creek, the city disappeared and we were in the country again. Pulling into the park we checked in at the office, received our site number and stopped by the dump station. We arrived at our site and it was quickly obvious that we were not going to fit so we drove around, found one that would work and called the office to see if it was open. It was so we set up and settled in for our 4 day stay. Although you could hear the hum of the city in the background, the park feels very remote with excellent hiking/biking and wildlife/birding opportunities. We did get out on one hike (about a 5 miler) to McKinney Falls and the surrounding area. The city of Austin was awesome, lots of great restaurants, music and food carts and......good news!....... we found all the street corner solicitors from up north who ask for money and food. They migrated south and are alive and well here in the city of Austin, there is one on practically every street corner. The first restaurant we went to was The Salt Lick about 20 miles southwest of Austin. This was on our "must visit" list so we wanted to get there first. Having been featured on Man v. Food, Date Line and numerous publications we had to see if it was worth all the hype. Walking in, our senses were overwhelmed with the smells of BBQ, right in front is an open fire grill where they cook their ribs, brisket and sausage. It smelled and looked awesome! We wanted to taste everything so we did! In order of deliciousness, we got pork ribs, sausage, turkey and brisket. If we were to go back we would just stick with the ribs and sausage. If you go, bring cash and your own booze as they don't take checks or credit cards nor do they serve alcohol. Next up were the Food Trucks! There are approximately 1,000 scattered around the city. Barb had spent some time on the internet and scoped out a few that we wanted to hit. There are quite a number of trucks on First Street and South Congress Ave. Parking was a bear, especially if you have a crew cab dually. First, there were no open spots, second when we did find one we would not have fit. So we drove a little further away from the action, found a spot and walked back to the action. First up was Dock and Roll food truck where we got The Maine Event lobster roll. It was freak'in awesome! Soft bread roll filled with lobster and some dressings. It was by far the best thing we had all day but at $15 it had better be! We quickly split that and headed over to Gourdough's where they have a variety of gourmet donuts. It is not even fair to call these donuts, they may start with a donut on the bottom but they build it up from there. The one we chose was called Granny's Pie, where the donut was smothered with icing, pecans, bananas, caramel and gram crackers. It too was delicious. Still room for more, we headed over to Torchy's Tacos where we got the Baja Shrimp taco. I am not entirely sure what was in it (other than shrimp) but it was very tasty and a little spicy. I sipping on water for the next 20 minutes while it had no affect on Barb. Our belly's full, we wandered up and down the streets of Austin people watching, going in and out of shops and listening to the street musicians. We did not find any other food trucks that we just "had to have" so we ended our day with an ice cream. Is there any better way to end a day of eating? Our last full day in Austin we had one more restaurant that we wanted to get to. Rudy's BBQ is another Austin institution with several locations within the city. The atmosphere was great, picnic tables set up throughout, you just find an open spot and sit down. No plates here, they give you a piece of wax paper to use as your plate. We could not decide exactly what we wanted..... St. Louis Style Ribs? Baby Back Ribs? Plain Pork Ribs? Jalapeno Sausage? Smoked Sausage? Decisions, decisions.....After staring at the menu for several minutes we said "screw it" and decided to get one of each! Can't go wrong there and besides we could use the leftovers. I can't tell which one was the best because they were all equally as good! So, it is with bulging beltlines that we leave Austin and continue our journey east. The next two weeks will bring us to locations in Louisiana and Alabama, I better check the axle weight on our trailer as I am sure we will put on a few more pounds at our New Orleans stop! Three days in the Tucson area is just not enough to see everything we wanted to see in the area. The Desert Museum, Saguaro National Park, Old Tucson, Pima Air Museum…….not to mention other local attractions such as Tombstone and a mine tour in the quaint little town of Bisbee Arizona. As our friends and family up north are huddled in front of their heaters enduring temperatures in the negative teens and twenties, Barb and I deliberated which sites to see while suffering through temps that reached over 80. Oh, the sacrifices we make in the name of adventure! In the end, we decided on the national park, the desert museum, Tombstone and the mine tour. Decisions we would not regret. Our first few days in the area were spent at Snyder Hills BLM area. This area is located off of Hwy 86 just south of Tucson and is a great spot for a couple days of free camping. We could hear these guys around the trailer at night so we kept Daisy on a short leash! Our previous two weeks had been filled with meeting new people on the road, our trip to Tucson involved meeting up with friends as well. Who do you suppose were spending the night in Tucson on their trip from Florida to Lake Mead? That’s right, our friends Steve and Joan! As big as the country can seem at time, it is amazing it can also seem so small, what are the chances they would be passing through when we were there? We were able to get together for dinner at Texas Roadhouse. Although it was a quick visit, it was great to see them and…..bonus….Joan gave us a bag of freshly picked pecans from Alabama! The Saguaro National Park is only about 10 minutes from Snyder Hills. Although it may not have some of the prominent geological features found in other national parks it was still very interesting. Although much of the area has been protected since the early 1930’s it did not become a national park until 1994. Cattle grazing and human encroachment has severely diminished the Saguaro in the area, thankfully within the park boundaries they are virtually untouched. The Saguaro, called the Monarch of the Desert, starts out its life with a seed the size of a pinhead. At the end if it’s first year the Saguaro is ¼” tall, at 15 years, 12” tall, 50 years, 7’ tall. They start growing “arms” at about 75 years old and a 25’er can be as old as 200 years old! Given this it is understandable why they need an area of protection. A few of these "monarchs" were well 100 years old! In addition to the Saguaro, there is a huge number of other plants, animals and birds that we have not seen before. Although considered a desert, there is as much life out there as you would see in a Wisconsin forest. Truly amazing. Our next adventure was the Arizona Sonora Desert Museum. The cost was $20.00/person to get in and is a combination museum/zoo along with a botanical garden, art gallery and aquarium with lots of historical artifacts from the prehistoric era to Native American. The most interesting part for us was seeing all the different types of plants and cactus in the area. While walking the desert earlier we saw all sorts of interesting plants but had no idea what they were. Now, we at least know the names of a couple, useful information as everything here is new to us. Testing out her new bat ears. The next day we traveled an hour to Tombstone Territorial RV Park. With our Passport America discount the park was less than $19.00 for the night. Tombstone is a typical tourist town full of shops trying to lure you in to buy their wares. We spent the day in the town of Tombstone walking the streets going in and out of each of the shops. If you are able to look beyond these and let your mind wander and look at the architecture of the buildings and imagine what this town was like back in the late 1800's it is quite interesting. The highlight of our trip there was attending a reenactment of the gunfight at the OK Corral as well as viewing the shops, wagons, pictures and articles from back then. We were hesitant to pay the $10/person to attend the reenactment thinking it was going to be a corny skit with bad acting but we had come this far so why not? What actually occurred was quite the opposite, we were entertained and educated for 30 minutes by some pretty good actors who got the crowd involved throughout. We walked away feeling the $20 was well worth it and it made our trip. Leaving Tombstone we headed back towards our campsite and stopped at a the ghost town of Fairbank where we walked among some of the old buildings and cemetery. Here is so much history in this area that it is hard not to get caught up in it and imagine what life must have been like in the 1880's. The town was the railroad hub for Tombstone and surrounding towns but slowly died over the next few decades. On our last day in the area we headed to Bisbee to visit the Queen Mine. We took the rig with us as it was on our way to the next stop. We called ahead to make sure there was parking that would accommodate us and were told it would not be a problem. They lied. We pulled into the lot and it became quickly apparent that not only could we not park there, we could not even turn around! Luckily we were able to sneak into an RV park adjacent to the mine and get it turned around and found a sketchy spot to park the rig. The rig parked, and tensions high, Barb and I headed into the Queen Mine building. We paid our $13.00 and headed in for the tour. The Queen Mine, one of the greatest copper camps the world has ever known. In almost 100 years of continuous production before the Bisbee mines closed in 1975, the local mines produced metals valued at $6.1 billion (at 1975 price) one of the largest production valuations of all the mining districts in the world. This staggering amount of wealth came from the estimated production of 8,032,352,000 lbs of copper, 2,871,786 ounces of gold, 77,162,986 ounces of silver, 304,627,600 lbs of lead and 371,945,900 lbs of zinc. Donned with hardhat, rain suit and flashlights we headed to the mouth of the mine where a motorized mine car and trolley carts awaited us to take us into the mine. The bicycle type thing below was how the mine boss traveled throughout the mine checking on his workers. Legend goes that the workers would steal the bike and hide it from the mine boss so he had to walk if he wanted to check on them! The cart behind the bike was the typical cart used to take the ore out of the mine. The shoots above the cart was one of the methods they used to fill the carts. In the early days the young strong men of the mine would be assigned to move these carts which would weigh 3/4 of a ton. Later, they used mules which could move 4 carts at a time. The mules were later replaced by the motorized carts. Another method used to filled the carts were these loaders. Several types of drills were used throughout the mines history, starting with pointed steel rods hammered into the rock wall to a depth of 7 feet. Miners would get an average of two holds drilled each day. Hand drilling was replaced by drilled driven by water and air, the latest drill would take on 7-10 minutes to drill 7 feet into the rock. Once 25 holes were drilled each hole was filled with several sticks of dynamite and detonated to get to the ore.
And no mine is complete without the crapper cart! Next up, we add two new states to our travels....New Mexico and Texas! Thanks for stopping by......Go Packers!